To continue with my K.I.S.S. Christmas decorating, let me present to you the simplest mantel that I’ve ever created. I do love a good game of Pictionary, too. Joy to the World? Get it? I scored that beautiful globe for just $16.00 recently at Easy Street Resale which might just be my new favorite place to shop in the whole state of Alabama. It’s a vintage Rand McNally that still has the USSR on it. It’s old school from back when I was a kid and Pluto was still a planet. Love it. 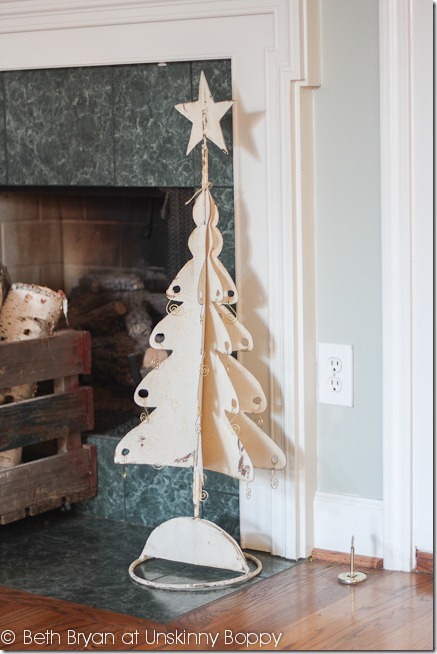 The curved metal Christmas tree was one of the awesome products featured in the giant Stuff the Stockings Giveaway a few weeks back. It was made by a local Alabama artisan named Cindy Cail of Simply Ornamental. I LOVE Cindy’s work, and this tree has been on my wish list for quite a few years. This year I snagged myself one from her booth at Christmas Village. The center piece of chippy blue ceiling tin was found at this year’s Country Living Fair. The wreath on top came from the 2010 Country Living Fair! I love that place. I found the letters at Home Accents, another local decorating store in Shelby County. I spray painted them with a high gloss white enamel spray paint which gave them a shiny finish. It was 72 degrees when I snapped these pictures. There was no way I was lighting a fire in the fireplace so the crate o’ birch logs worked well instead. 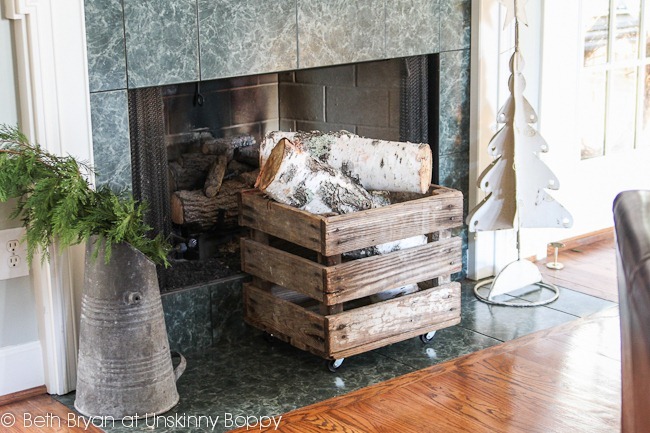 The coal scuttle and birch logs on the hearth also came from the Country Living Fair, and the white metal tree was another Easy Street Resale find. The house is all ready for Christmas! 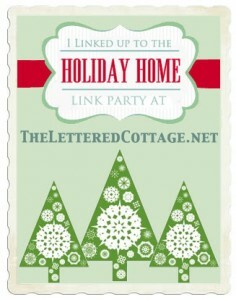 Be sure to take the whole Holiday house tour here! I’m Stop number 15 on Jenn Rizzo’s Holiday House Walk. The tour started today at my friend’s Thistlewood and At The Picket Fence. Be sure to check them out! 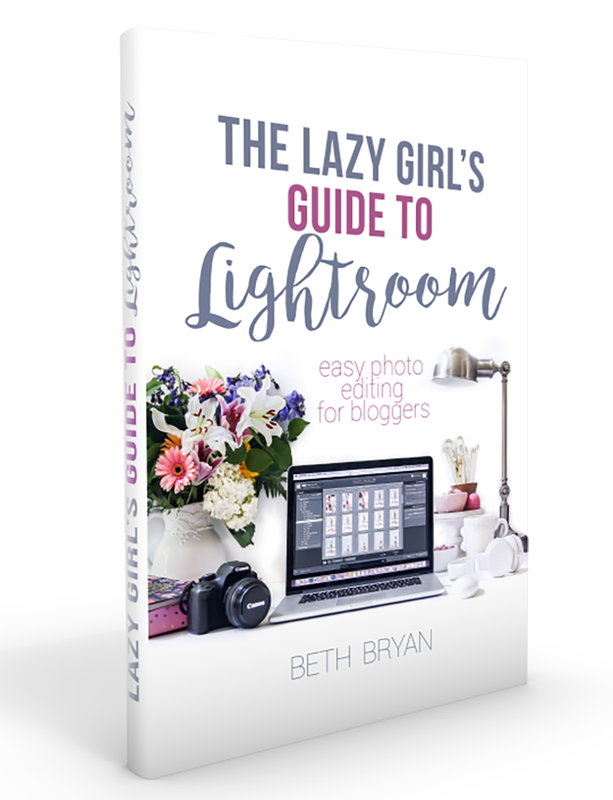 LOVE it Beth! Please, come and decorate my house. I have stuff, just dont know how to place it. Your place is gorgeous! I too am a HUGE fan of Easy Street ReSale. I was just there last week and spotted the tree on the hearth you have. I hope the one I saw is still there….and not that one 😉 to cute! Great job, as always!!!! Beth those tiles are great. I liked how you spelled out JOY, that is so neat. Thanks for sharing your mantel with us. Happy Holidays. 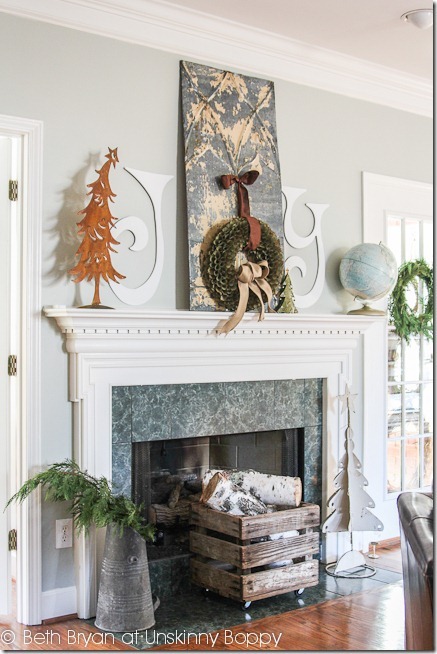 I love the mantel, the globe takes it to a whole other level. You are so clever!! Who ever thought there would be a day when we pay for logs for home decor? I searched high and low to no avail to find some for my daughter’s woodland themed birthday. Don’t ever let them go! Thanks for sharing. Your house is so lovely! So pretty! I just posted my living room today too. I LOVE Christmas!!!! Especially love the globe – and the price! You are so classy Beth — I just love every inch! The humor in the snoman and “joy” are so wonderful… Should I go on? Cause I totally could because you are amazing and wonderful and your house is just DIVINE! Love your mantel…so clever with the globe! 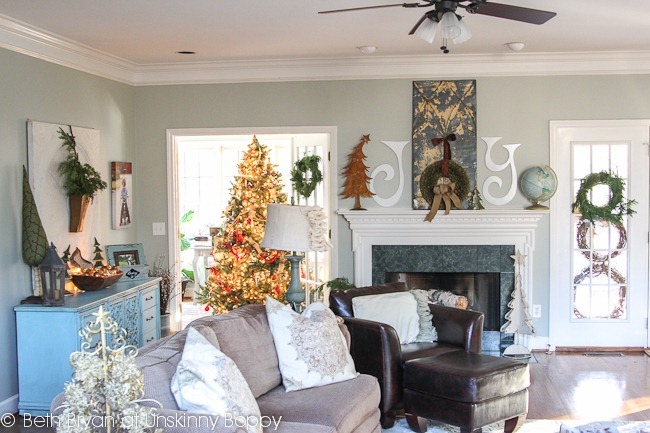 Your whole house looks lovely and I am a little jealous because I am so far behind on decorating this year! 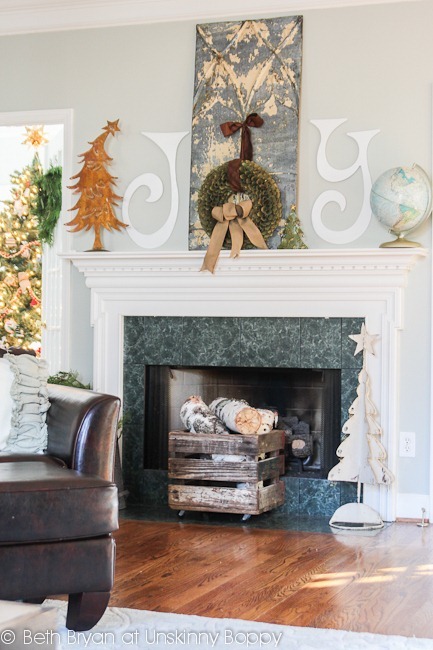 Love that your mantle is simple yet so pretty!!! A true JOY for your living room! I love your whole Joy to the World theme…so creative! Did you make the crate the birch logs are in? It’s perfect in front of the fireplace. absolutely gorgeous! love, love, love Easy Street! Okay, this is great! 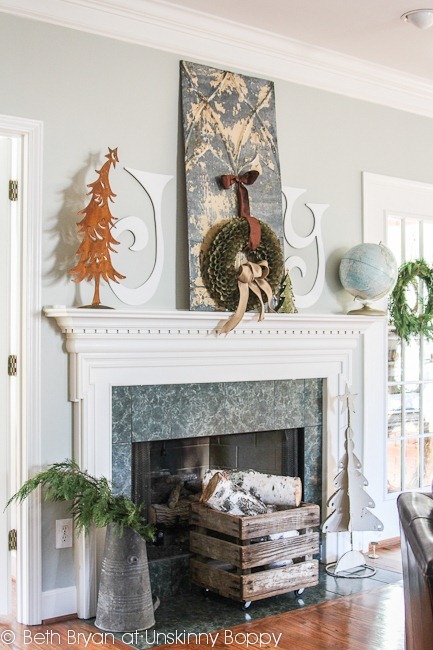 Love the mantle. 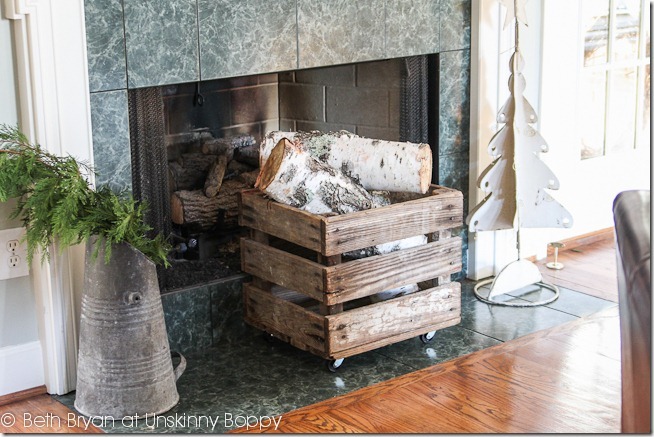 Love the crate of birch logs in front of the hearth. It’s all great! 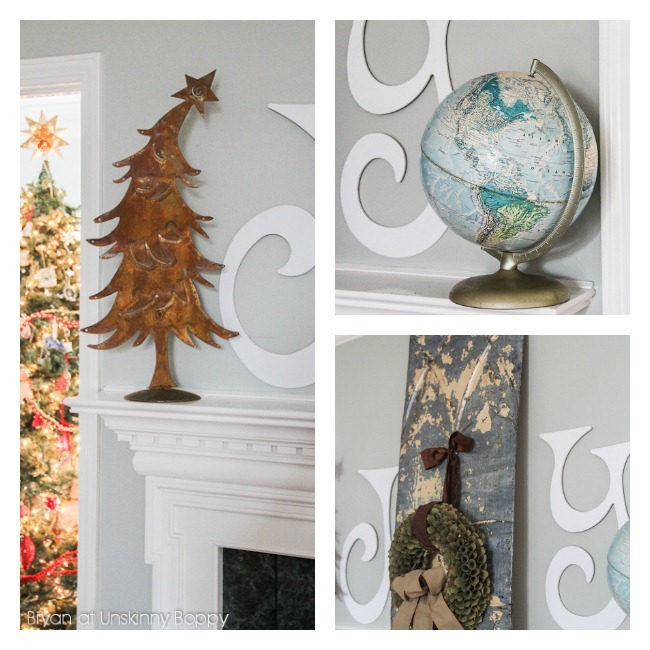 Joy to the world, Beth has a globe and a skuttle and birch logs … and everything else that’s fabulous! I’ve got a globe collection and it looks like your little orphan needs to come join my globe family!